Neglected in his own childhood, Philip Stanhope, 4th Earl of Chesterfield, had determined to give his illegitimate son Philip a good education. He, therefore, wrote him many letters, giving advice on all kinds of matters, from deportment to morals, from etiquette to books. 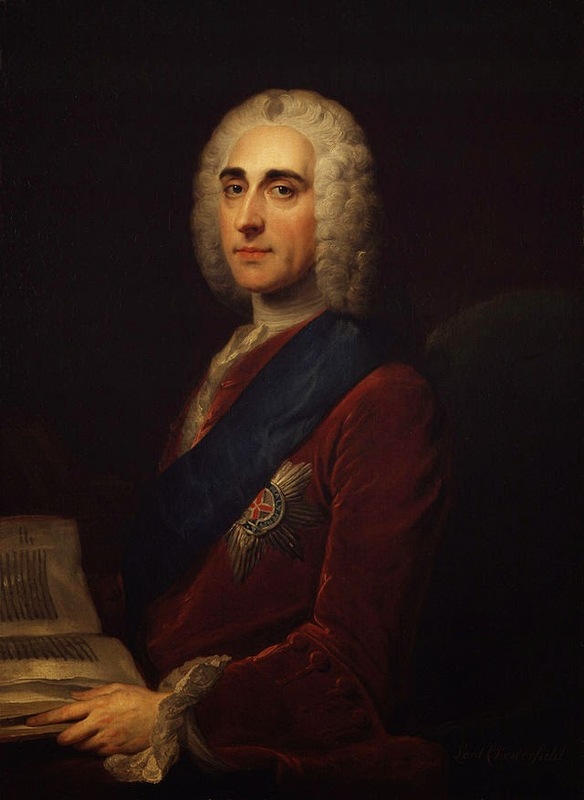 Lord Chesterfield never thought anyone but Philip would see his letters, but they were later published and became very popular during the 18th and 19th centuries. Although many of his recommendations are old-fashioned, a lot of them still ring true today. All of them, though, provide a fascinating insight into the manners and life of an 18th century gentleman. Here are a few extracts. A man who sets out in the world with real timidity and diffidence has not an equal chance for it; he will be discouraged, put by, or trampled upon. But to succeed, a man, especially a young one, should have inward firmness, steadiness, and intrepidity, with exterior modesty and SEEMING diffidence. He must modestly, but resolutely, assert his own rights and privileges. ‘Suaviter in modo’, but ‘fortiter in re’. He should have an apparent frankness and openness, but with inward caution and closeness. All these things will come to you by frequenting and observing good company. Next to good-breeding is genteel manners and carriage, and the best method to acquire these is through a knowledge of dance. Now to acquire a graceful air, you must attend to your dancing; no one can either sit, stand or walk well, unless he dances well. And in learning to dance, be particularly attentive to the motion of your arms for a stiffness in the wrist will make any man look awkward. If a man walks well, presents himself well in company, wears his hat well, moves his head properly, and his arms gracefully, it is almost all that is necessary. Many people lose a great deal of their time by laziness; they loll and yawn in a great chair, tell themselves that they have not time to begin anything then, and that it will do as well another time. This is a most unfortunate disposition, and the greatest obstruction to both knowledge and business. At your age, you have no right nor claim to laziness; I have, if I please, being emeritus. You are but just listed in the world, and must be active, diligent, indefatigable. If ever you propose commanding with dignity, you must serve up to it with diligence. Never put off till tomorrow what you can do to-day. I here subjoin a list of all those necessary, ornamental accomplishments (without which, no man living can either please, or rise in the world) which hitherto I fear you want, and which only require your care and attention to possess. To speak elegantly, whatever language you speak in; without which nobody will hear you with pleasure, and consequently you will speak to very little purpose. An agreeable and distinct elocution; without which nobody will hear you with patience: this everybody may acquire, who is not born with some imperfection in the organs of speech. You are not; and therefore it is wholly in your power. You need take much less pains for it than Demosthenes did. A distinguished politeness of manners and address; which common sense, observation, good company, and imitation, will infallibly give you if you will accept it. A genteel carriage and graceful motions, with the air of a man of fashion: a good dancing-master, with some care on your part, and some imitation of those who excel, will soon bring this about. To be extremely clean in your person, and perfectly well dressed, according to the fashion, be that what it will: Your negligence of your dress while you were a schoolboy was pardonable, but would not be so now. Upon the whole, take it for granted, that without these accomplishments, all you know, and all you can do, will avail you very little.